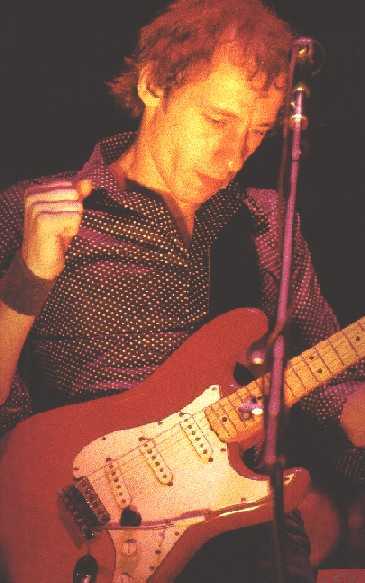 This Stratocaster is probably from 1961 or 1962, the serial number is 80470. The guitar is refinished in red. It has a laminated maple fingerboard (no one-piece maple neck like the Fender Strats from the 50ies). For this reason there is no 'skunk stripe' at the back of the neck and no dark spot at the headstock. Normally Fenders had a rosewood fingerboard in the early 60ies. I have seen one or two with a laminated maple board like this one, but I prefer to think that what we have here is a later modification. Note that the strap button is at the back of the guitar, near the number plate! The guitar had a white plastic pickguard (original would be a greenish-white celluloid guard), and the volume poti was moved towards the bridge (possibly to have more space for resting those two fingers). There is no information available about the pick-ups installed. Mark's friend Steve Philips (of the Notting Hillbillies) once told me he remembers that Mark gave this guitar to a luthier called Sam Lee (or Sam Li?) in Soho for these modifications. Is this an original Fender or a Japanese fake? Originally Mark considered this guitar as an original Fender from the early sixties. 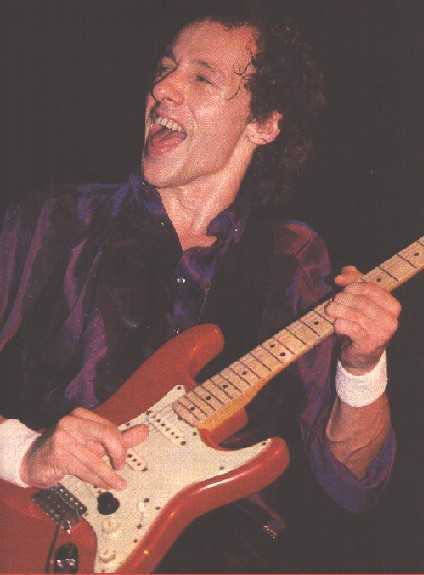 It was Sohn Suhr, builder of the Pensa-Suhr, now owner of Suhr guitars, and who worked a lot on Mark's guitars in the 80ies, who claimed that this guitar was a Japanese fake, and that Mark was not aware of this.